I know, I know, you see this blog and you think "Peas and Carrots! Gross!" And if you are one of those poor souls, like me, who's primary experience was the mushy mess in the school cafeteria you have the right to be skeptical. However, The Kitchen Wife is here to show you that there is a brighter side to your peas and carrot woes. Who knows, this may even become one of your favorite, go-to sides! In a sauce pan, melt the butter over a medium/high heat and add the carrots. Saute the carrots until they begin to brown and become tender, about five minutes. Then, add the frozen peas to the pot along with the chicken stock. Cover and let steam for another 7 minutes. If you want to keep this meat-free simple use vegetable stock or water in place of the chicken stock. Next, add some salt, pepper, and the thyme. Cover and cook for 3 more minutes. There you have it! 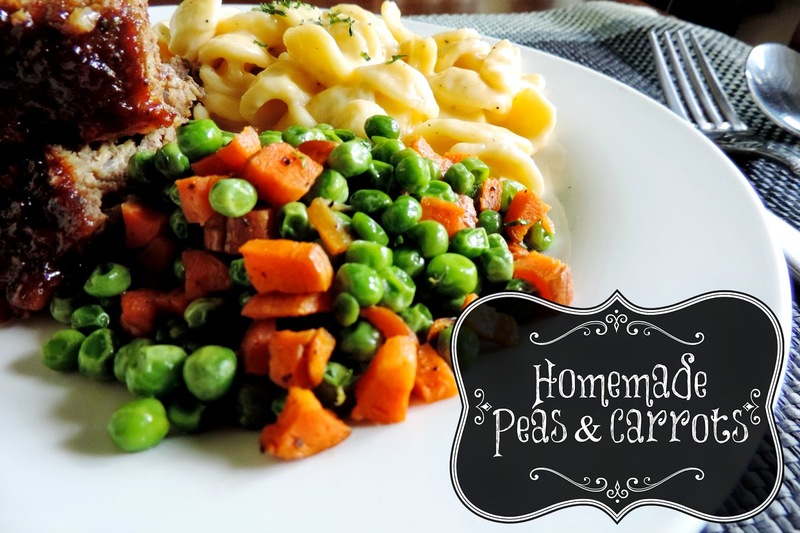 Delicious peas and carrots that are tender and al dente, Not mushy and, well, gross! They are full of flavor and I know your family is going to love them! ENJOY! In a sauce pan, add the butter and carrots. Saute the carrots until the start to brown and soften, about 5 min. Next add the frozen peas and chicken stock. Cover and simmer for another 3 min.